Well, we successfully got the barn done (enough) before the seasons changed too much. Less than two months from start to finish – not too bad. 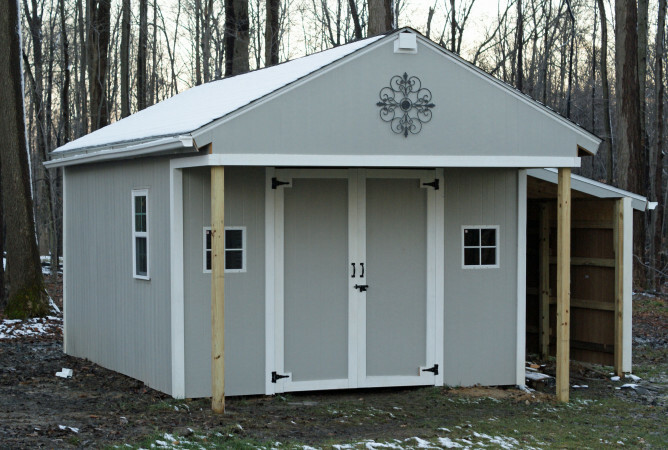 Side note: I use barn and shed interchangeably – is it only a barn if it houses animals, or only a shed up to a certain size? 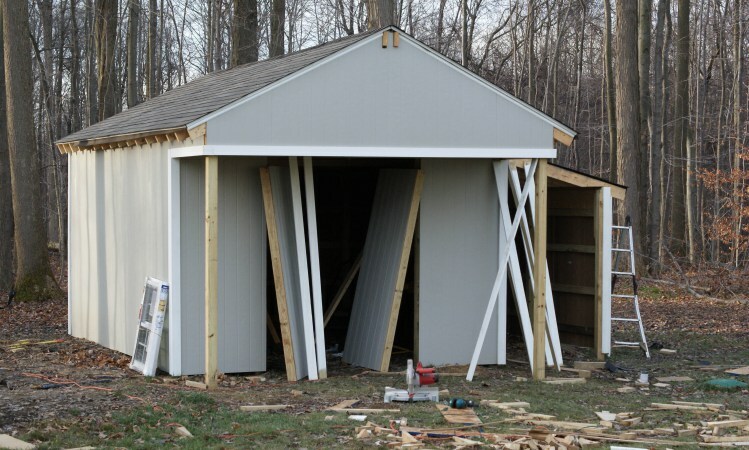 Not that I really care, cause I’ll call it whatever, just curious if there’s accepted barn vs. shed terminology. Anyway, I got the gutters up and the last window installed during that beautiful Thanksgiving weekend weather we had, so we’re good to go. I’ve started moving the wood into the lean-to, and the lawnmower has already vacated the garage. There’s still some paint touch-up to do, and putting something on the floor (crushed lime? ), and continue to move wood from the other piles, but that’ll likely wait until the spring, unless we get another warm weekend this year. 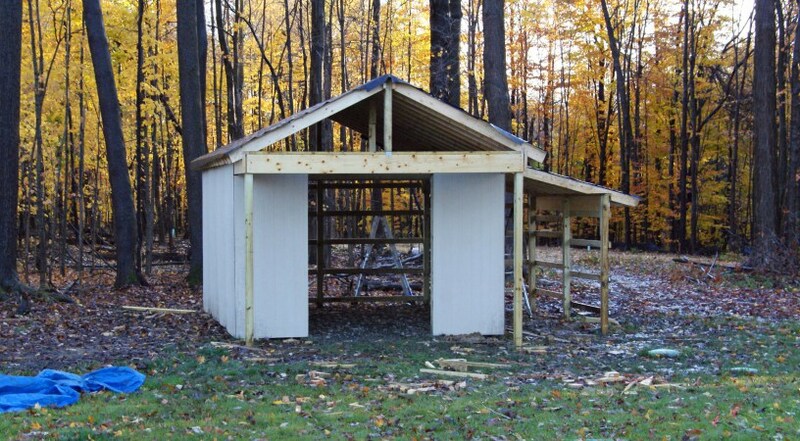 Structurally, it’s sound, and it’s more or less weatherproof, so I’m considering it done. I’m not going to get into detailed plans, but I’ll talk through the construction a little for anyone interested. It’s a pole-style building, so instead of footers and the usual foundation, I just dug some holes (about 24-30″) and put a 4 x 4 x 10′ and a bag of concrete in each hole. Making sure to level before it dries. 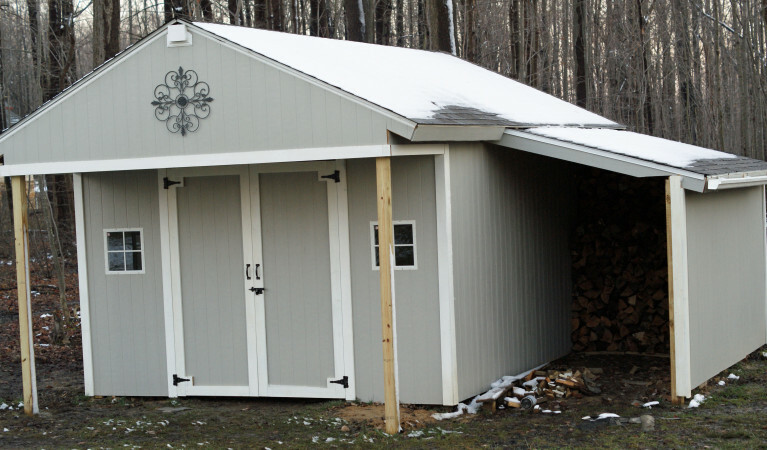 The footprint is 12′ x 16′, with the lean-to about 8′ x 12′ and an overhang extending an additional 4 feet in the front. 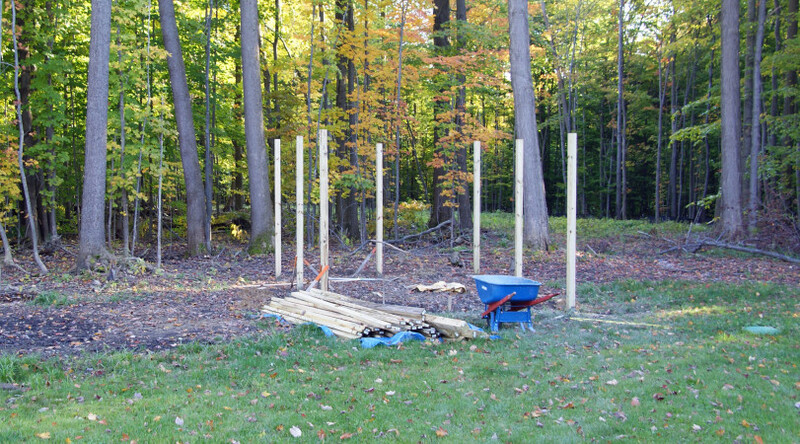 Posts are three per side (including corners), spaced every 6′ in the back and every 8′ on the long sides. The front has four posts to account for the doors. Once the posts are in, attach 2 x 4s between each pair to make a frame (I did five per, about every 16-18″; spacing doesn’t need to be perfect, except where you want to install windows). Finally, use 2 x 10’s to create a header. Be sure to secure well, as this will bear most of the weight from the roof. When the frame was complete, we did the rafters. First securing a 2 x 6 x 16′ running down the center of the frame (extended up to account for slope, of course), we cut 2 x 6 x 8’s to fit, leaving about 12″ overhang. We attached the rafters by cutting a wedge out of the board, and resting that on the header. Probably not suitable for larger construction projects, but it should hold up here. 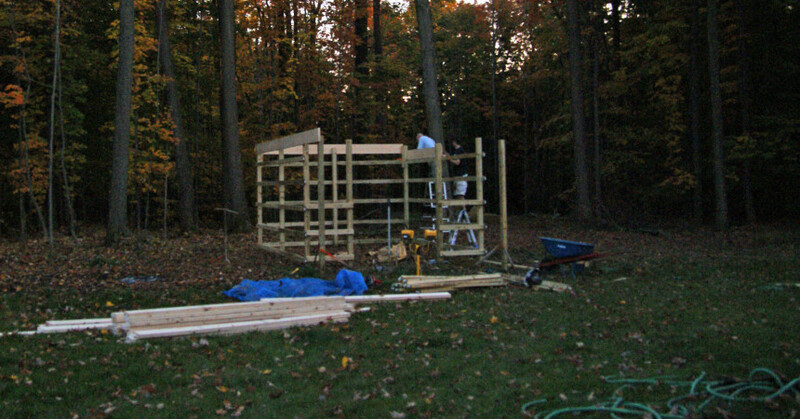 Once the rafters were in place, we put up sheets of OSB (plywood would also work). To finish the roof, staple some roofing felt, then nail the shingles down. With the roof up, we put up the siding, 4 x 8 sheets. Just cut to fit and nail to the frame. Siding complete, I was able to paint everything, install the windows and doors (just build a couple rectangles to fit the opening, and attach the hinges), and put up some trim to clean things up a bit. Yes, those instructions are very simplified, but it wasn’t an overly complex project, just time-consuming because of the scale. Not overly difficult either – the only thing requiring multiple people was getting the roof up. Most everything else, I was able to do on my own. I tried to recruit C to help, but he was content with watching me while banging on the window of his playroom. 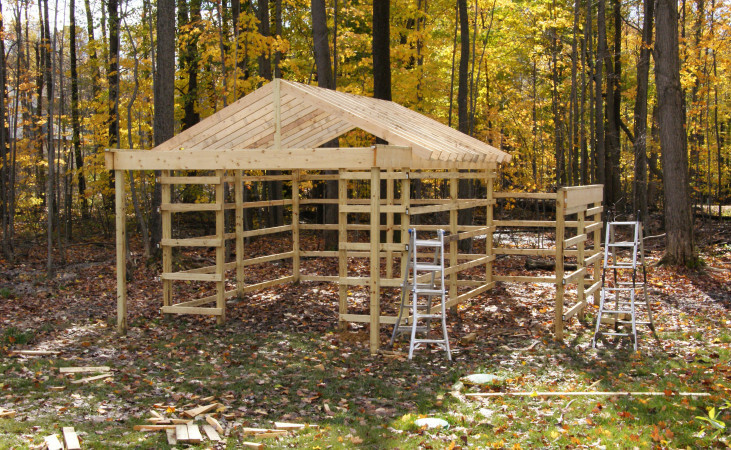 Basic structure, but I just wanted a place to keep some yard equipment and have a supply of logs under cover, and this will do the job just fine. Now I can check that one off the list and move inside for the winter. Leaves are still green in this one - feels like so long ago. From green leaves to snow on the roof. wow! looks awesome Gabe! great job!